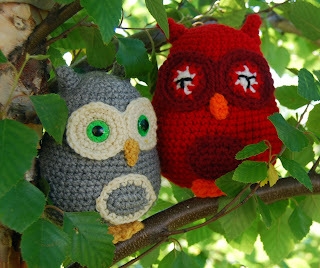 I finally got the pictures of my finished owls together for you. If you remember from the earlier lessons, I was working on four different owls, using different yarns and trying some new things as I went. 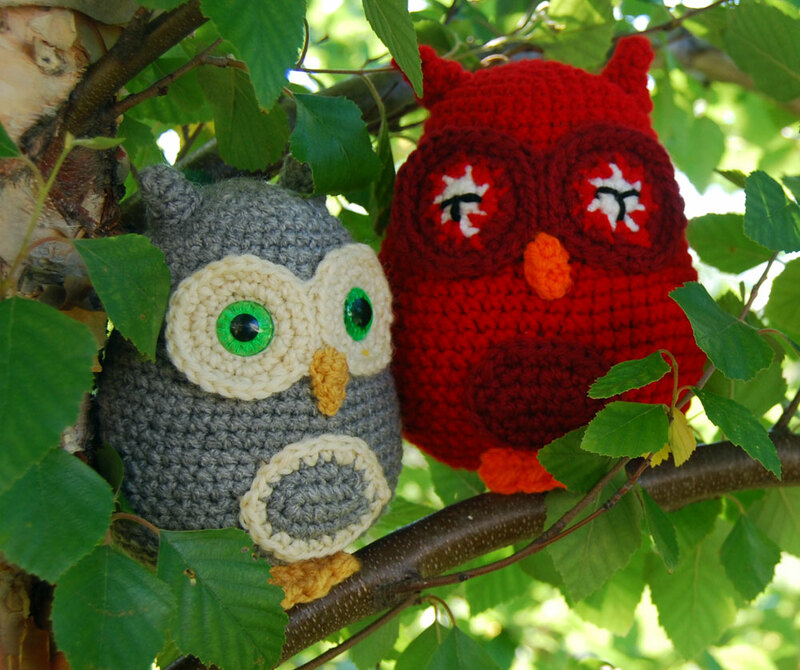 The owl that you're probably most familiar with is Big Red, pictured below on the right. To make Big Red, I followed the pattern exactly -- with two exceptions. I used worsted weight yarn instead of sport weight and a G (4 mm) hook. I chose to do this in order to make it a little bit easier to show what I was doing in the lesson pictures. The little gray owl on the left uses sport weight acrylic yarn on the body and a worsted weight wool yarn for the white accents. I wanted to show here that you can use different weight yarns together successfully -- as long as you keep your gauge consistent. On an interesting note -- even though Big Red is sitting up a little higher than her gray friend, you can easily see a size difference between the two owls. The tan owl is made exactly to the pattern. I used Red Heart Designer Sport yarns for all of the pieces and a size E (3.5 mm) hook. The blue owl was my "fun" owl. He's made with worsted weight yarn and a size E (3.5 mm) hook. By comparison, he's definitely smaller than Big Red and seems to have more in common size-wise with his sport-weight cousins. While working on Little Boy Blue, I decided to try embroidering some feathers onto the belly patch. The texture was inspired by one of the Harley & Boss Owlets. 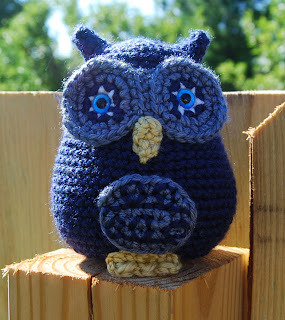 Like the gray owl, Little Boy Blue uses plastic safety eyes instead of the embroidered alternative. Blue's eyes are 9 mm translucent owl eyes that I purchased from 6060 and the eyes on the gray owl are the same in a 12 mm size. 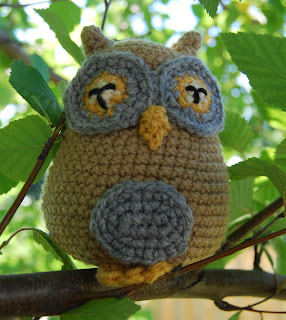 For details on the yarns used on each of the owls, please visit my Ravelry notebook. Each of the owls is listed separately. I must say the little blue owl is my favourite. I love the way he has little star's around his eyes ^_^. these are awesome!! I am so behind with crocheting these days. You are so amazingly talented! Steph & Katie -- it's always so hard to motivate yourself to work with yarn when it's 90 degrees outside :-) I'm sure you'll be back to your crochet when it's cooler!